Every December 24th millions of children eagerly await a visit from a large, bearded man in a red suit. But where did Santa come from and how did he evolve into today's Jolly Old Saint Nick? Well before Washington Irving's legendary poem 'Twas the Night Before Christmas' shaped the modern vision of Santa Claus riding a flying sleigh pulled by magical reindeer, his story actually began about seventeen hundred years ago in the Eastern Roman Empire. There, a young orphan named Nicholas became famous for using his inheritance to give gifts to the needy. In his most wildly-known story, he threw bags of gold over a wall into the house of a destitute merchant, so that the man would not be forced to sell his daughters into slavery. Eventually, this young and holy man became the Bishop of Myra and lived a life of faith and miracles, fighting injustice and protecting the weak. Even after his death, his miracles continued, and he is credited with saving sailors, healing the sick, and even raising the dead. In time, he became known as St. Nicholas the Wonder Worker. In the numerous centuries since the passing of Saint Nicholas, his story has grown, developed, and been combined with numerous other legends. In the Netherlands, he became known as Sinterklaas, the old man who brought presents to children with the help of his assistant Zwarte Piet. In England, he became Father Christmas, the living embodiment of the holiday. Fully illustrated with original color drawings, Santa Claus celebrates the story of his beginnings as a holy man in Ancient Rome, through his development in the Middle-Ages, to his current, likeness on advertisements, greeting cards, apparel and decorations - right down to real-life mall-based family photo opp. It is a winding, magical tale filled with mystery and good will towards all men, sure to fill even the most jaded scrooges with a little bit of Christmas magic. A portion of all of the profits from this book will be donated to help disadvantaged children throughout the world. According to Amazon, this is Non-Fiction, Political and Social Sciences and Sciences. Interesting. 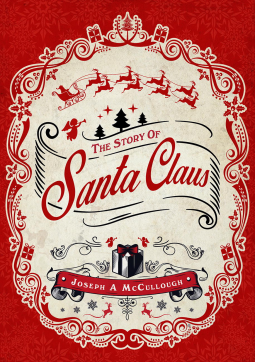 For people who would enjoy reading tales of how ‘Santa Claus’ came to be throughout history, then this book would be enjoyable read for them, especially in the genres the book is listed in. Honestly, I thought I was getting a book that was much more classic of ‘our’ Santa Claus, and aimed more towards family, especially our children, but I was very wrong. I truly think it was the cover that clearly gave me the wrong idea. It looked so inviting, especially for children. The only thing this book will do for our children is put them to sleep, although maybe that is what a 'goodnight story' is all about. Your children are not going to understand anything in this book until it gets to the end when it has The Night Before Christmas poem in it, and when it talks about Rudolph the Red Nose Reindeer. I did not enjoy this book, sadly, and it's a shame for your children because they won't understand this at all. You will ruin Santa if you do read this to them, again only if they can understand it. Allow your kids to grow up and become adults before you give this one to them to read ruining what we know of Santa today. Allow them to be able to make their own decisions, too. Don't believe me? Get the sample and read it. Also know that Chapter One in the sample stops before it gets to become to difficult and technical for children to understand. This book starts all the way back to the early years of AD. There were so many things I could not buy in the stories that were told ‘word of mouth’, such as God talking to people, (that belongs in the bible) having visions of God coming to them in their dreams where He tells them to do this or that. I believe in the bible, NOT a book like this that is telling us stories asking us to believe in them. If this were the case, these stories would be in the bible, but they are not. Not until towards the end of this book does it start to talk about the Protestants coming here to the US because they wouldn’t buy into the Catholic religion and wanted to split off and have the freedom to do so, and the versions of Santa Claus (or whatever the author called Santa at that point). It was the Protestants vs. the Catholics. The Protestants won over their version of Santa here, but wasn’t freedom of religion mostly why they came over here in the first place? It wasn’t until the 1820’s that people started to claim they saw a man flying through the air with reindeer. This was the start of ‘our’ Santa Claus as we know him today. When Clement Clarke Moore wrote a poem called ‘Twas the Night Before Christmas, this still remains today as the most popular and widely read poems of all time. (Heck, my daughter could recite this entire poem when she was eighteen months old! I’m NOT kidding! Word for word! She LOVED it! Heaven knows we read it every night, even when it was not even close to Christmas!) This is not told to us until the 77% mark, so we went through a LOT of supposed Santa history before we even get NEAR to today. You can imagine ALL of the made-up stories that happened prior to this! There are a LOT of them! Mrs. Claus - no one has a good story for how she came to be. Why ALL these years people felt the need for a Saint who only did good for the good children/people, I do not know, but we still have that, don’t we . . . except the bad children are NOT punished when they WERE way back then! Yes, they got nothing, or something to make them act good! Instead, today we glorify bad kids behavior despite, so maybe back then it wasn't a bad thing that they didn't put up with it at all! I think we have at least that part backwards today! Although the kids would not side with that! If you think you want to read ALL about this saint, you’ll love this book. I think for the majority of people, we’ll still like the current ‘fairy tale’ version! I do! Nothing will sway me from it, either. One more thing. 1939. Rudolph the Red Nosed Reindeer, Gene Autry and Montgomery Wards! (Some of you may be too young to know what Montgomery Wards is!) The invention of Rudolph helped us get through World War II. The rest of you know the rest! I feel there are much better books out there when it comes to the history of Santa Claus and I have enjoyed them much more so than this one. I received this book for FREE from the Publisher, Osprey Publishing, and NetGalley, in exchange to read and write a review about it. "Free" means I was provided with ZERO MONIES to do so, but to enjoy the pure pleasure of reading it and giving my own honest opinion no matter whether it is positive or negative. I am disclosing this information in accordance with the law set here: http://www.access.gpo.gov/nara/cfr/waisidx_03/16cfr255_03.html., The Federal Trade Commission's 16 CFR, Part 255, 16 CFR 255, Guides Concerning the Use of Endorsements and Testimonials in Advertising Federal Acquisition Regulation.